The tech blogs are heaving with the news and analyses of three major mobile operating system upgrades, Apple iOS 5, Windows Phone 7.5 Mango and Android 4.0 Ice Cream Sandwich. The falling months of the year, which is already known for several technological advancements, are to get hot products on these three competitive platforms. Here we compare two premier products on iOS 5 and WP7.5 Mango, respectively iPhone 4S and HTC Radar. Apple has unveiled its 2011 iPhone upgrade iPhone 4S on iOS 5 two week back. HTC Radar will be one of the first phones on Windows Phone 7.5 Mango, Microsoft’s new bludgeon to win soil for its not-yet flicked Windows Phone. Apple iPhone 4S is to play on iOS 5, known as the most advanced iOS upgrade ever. HTC Radar is the Taiwan technology maker’s first phone on WP7.5 Mango, the latest version of the mobile OS from Microsoft. Apple and Microsoft have been in a well-known rivalry from Mac-Windows clash itself. Microsoft has now pledged to become an active player in mobile OS industry defying both Apple and Google. The question which of iOS 5 and Windows Phone 7.5 is the best is fairly not easy to answer. As of now, iOS 5 with around 200 cutting-edge features can beat any rivals on its way. Microsoft has designed its WP7.5 Mango update with some progressive features like tile-based home screen, enhanced multitasking capability, grand web browser, and many more. Winner: Apple iPhone 4S. iOS 5 is equipped with unrivaled features like iCloud, iMessage, Newsstand, Notification Center and many others. You have a 1GHz dual core ARM Cortex-A9 CPU on Apple’s popular A5 chipset inside iPhone 4S. Apple A5 chip, already on iPad 2, is one of the world’s best processors. Any Windows Phone phones will not be able to raise threat to iPhone 4S’ dual core processor. Microsoft has limited the processor capacity of WP7.5 Mango devices at single core to reduce power consumption. HTC Rader is with only a 1GHz Qualcomm Scorpion on the MSM8255 Snapdragon chipset. Even if you admire the Windows Phone 7.5 Mango aspect of HTC Radar, many things like camera will disappoint you. The HTC smartphone on WP7.5 Mango is up with a 5-megapixel camera at 2560 х 1920 pixels and 720p video capture capability. The device’s frontage has a VGA camera for video chatting. Apple iPhone 4S, on the other hand, is equipped with a massive 8-megapixel camera at 3264 × 2448 pixels and coveted 1080p video capture. In addition, things like an LED flash, autofocus, touch focus, geo-tagging and face detection add into the perfection of iPhone 4S’ camera. You have a 3.5-inch high resolution Retina Display on iPhone 4S. The display offers a resolution 640 x 960 pixel at 330 pixels per inch. Apple’s Retina Display technology is celebrated for amazing clarity of images and videos. HTC Radar features a 3.8-inch S-LCD capacitive display at 480×800 pixel resolution. Winner: Apple iPhone 4S. Retina Display wins over Super LCD. Apple sells 16GB, 32GB and 64GB models of its iPhone 4S respectively for $199, $299 and $399. Pricing details of HTC Radar are not known. The company has just announced the WP7.5 device. Winner: No winner; price of HTC Radar is not available for comparison. 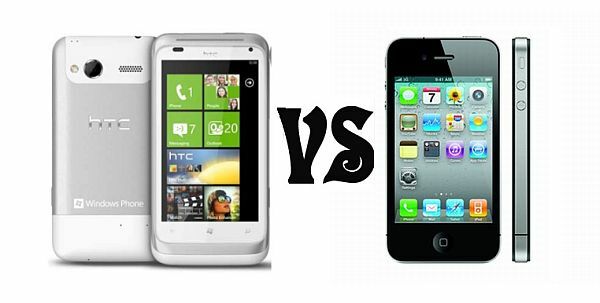 Apple iPhone 4S is the ultimate winner in its comparison with Windows Phone 7.5 Radar. In all comparison parameters, the new version of iPhone has simply dominated its rival. Actually, HTC Radar is not manufactured in line with the current technological advancement of the world. When the new generation phones including iPhone 4S are coming with the most up-to-date components and features, HTC Radar is still with a 5-megapixel camera, and single processor. The only thing that gives attention for the HTC smartphone is that it runs on Windows Phone 7.5, the latest version of Microsoft’s Windows Phone OS. When is the iphone coming to sprint?